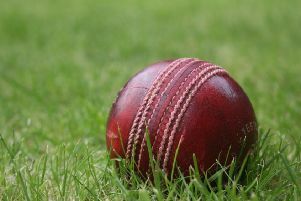 Thorpe Arnold kept alive their hopes of Division One survival with a precious win over Loughborough’s Second Xi on Saturday. The home side went into Saturday’s must-win game knowing defeat against opponents who were 44 points above them would almost certainly have meant relegation to Division Two. Thorpe lost the toss and were put into bat which wasn’t a bad thing with 30 points now up for grabs. Dom Exton was out early, but Myles Hickman continued his good form, making 52 until he tried one hit too many and was stumped. Sam Woods, at the other end, knocked the ball to all parts of the ground, reaching a magnificent 87 when he was out in the 43rd over. He helped guide Thorpe to a score of 215 which, on the face of it, looked a decent score. The hosts had 44 overs to bowl out Loughborough and things started as they had hoped. James Pepperdine took two wickets in his first two overs and Loughborough were reduced to 5-2 off five overs. Loughborough opener Chauhan tried his luck and hit some quick boundaries until Chris Waldron had him caught at cover for 37. Waldron then trapped Jamie Goddard in front to leave Town 65-4 off 15 overs. Edwards had a lucky escape when a nick behind off Waldron to keeper Exton was not heard by the umpire and he rubbed salt into the wound by hitting 43 until directly after drinks Hickman bowled him. The score was now 140-5 off 29 overs and the game was in the balance. A wicket apiece for Woods and Pepperdine reduced the visitors to 167-7, but they pushed the score on to 185-7 off 39 overs to leave 30 required off five overs. Mark Carnell came on and enticed another edge to keeper Exton and in his next over removed the number 10 lbw to leave Loughborough 193-9 with two overs left. Captain Rich Randall brought Hickman back with the number 11 on strike, hoping the extra pace would seal the deal. It proved a masterstroke as the third ball was edged onto the stumps to the delight of the Thorpe players. With all of the teams around Thorpe having to play each other, the maximum 30-point win keeps their season alive. They visit Sileby Town Seconds on Saturday (1pm). Thorpe: D. Exton 0, M. Hickman 52, C. Waldron 15, S. Woods 87, R. Randall 4, C. Read 17, R. Garner 7, M. Carnell 0, S. Turakhia 4, M. Starkey 0, J. Pepperdine 2*, Extras 0. Total: 215. Bowling: C. Waldron 11-3-38-2; J. Pepperdine 11-1-52-3; M. Hickman 9-1-45-2; S. Woods 8-1-26-1; M. Carnell 2-0-4-2.